Heidi Van Hoesen Gorton is currently Principal Harpist for the Toronto Symphony Orchestra since 2011-2012 season. She has been described as one of the most outstanding solo, chamber and orchestral musicians of her generation and has performed solo recitals the world over from New York to Los Angeles, Vancouver to Vienna. As an orchestral player Heidi has performed with the Pittsburgh, Boston and Hartford Symphony Orchestras. Heidi has been an active participant in the Strings Chamber Music Festival, as well as the Music Festivals at Aspen, Tanglewood and Interlochen. Heidi earned two degrees in harp performance from The Juilliard School of Music under the tutelage of Nancy Allen, and has also studied with Gretchen Van Hoesen, Anne Marguerite-Michaud and Elizabeth Fontan-Binoche. Actively competing in domestic and international competitions, she was awarded first place in the Young Professional Division of the American Harp Society National Competition in June of 2009. She has been a winner of an Anne Adams Award (2010), as well as a Victor Salvi Award (2008). Heidi has taught master-classes in Pittsburgh (Carnegie Mellon University), New Orleans (Tulane University), Charlotte, Denver, San Francisco, Syracuse, and Milwaukee. In 2010 she joined the faculty of the Advanced Chamber Music Seminar Summer Camp in Pittsburgh, PA.
Sue Richards is an internationally known performer, teacher, composer & author. Sue has recorded dozens of CDs & has entertained audiences throughout the U.S. & Europe. After studying the concert harp in Ohio with Lucy Lewis & Jean Harriman, Sue turned to the Celtic harp & the Irish/Scottish traditional music of her heritage. Sue has sat in with The Chieftains & appeared on A Prairie Home Companion. She has performed in Scotland at Celtic Connections in Glasgow & at Edinburgh International Harp Festival. She recently toured Norway & Sweden with the Harpa ensemble. Sue can be heard on dozens of recordings, both solo, with Ceoltoiri & with Grammy-nominated Ensemble Galilei, a group performing Celtic, Early & Original music. As a member of EG, she has written music & performed in 2 multi-media shows, A Universe of Dreams & First Person: Stories from the Edge of the World, the latter sponsored by the National Geographic Society. In addition to multiple Wammie awards, Sue has won the American National Scottish Harp Championship 4 times & is a Scottish Harp Society of America (SHSA) Distinguished Judge. She has served as president of SHSA, as well as of the Washington, DC, Folk Harp Society. Sue has taught at the Alaska Fairbanks Summer Arts Festival and at the Summerkeys Music School in Maine. She currently offers private lessons in the Washington, DC, area, and directs and teaches in the harp program at the summer Ohio Scottish Arts School in Oberlin, Ohio. For more information about Sue Richards, visit http://www.suerichards.net. Deborah Henson-Conant is a Grammy nominated artist, who sings & plays the harp, tells stories and composes symphonic music. She has made her own path, composing since age 12. She first studied classical harp, then she developed her own style, combining blues, swing and Latin Jazz, with storytelling and humor. Deborah has toured with the Boston Pops, premiered her own orchestral compositions, played at jazz clubs in Germany and Celtic festivals in France. In 2007, her one-woman show, Invention and Alchemy, debuted on PBS and was nominated for a Grammy award. You can find out more information about Deborah Henson-Conant at www.hipharp.com. Ismael Ledesma is a Paraguayan composer, & harpist. His career as a musician started with his mother`s group, Los Madrigales. His father taught him to play the harp at the age of 5. In 1982, he travelled to Paris in order to join a circle of Latin American musicians, like “Los Guayakies” with Pedro Leguizamon, “Los diablos del Paraguay” with Pedro Ramirez, and “Los Tupi” with Rubito Luna, among others. But in 1985, he decided to pursue a solo career. In addition to his artistic activities, Ismael perfected his French, enrolling at the University of Sorbonne in Language and French Civilisation. He also became a student at the International Music Conservatoire of Paris, Alfred de Vigny. Ismael has made 13 CDs with different producers: French, German, Swiss and Paraguayan. He received the recognition "Personality of Latin America" by the French Senate for his cultural and musical accomplishments. He has performed throughout the whole world; In Japan, in the US, Turkey, Egypt, Jordan and the European countries. He participates in important Harp Festivals, like the Prague World Harp Festival, The Edinburgh International Harp Festival, the Celtic Harp Festival Dinan, Harfentreffen Germany, at Stamford, England and many more. He also takes part in Paraguayan events, such as the Festival Paraguaype and the World Harp Festival in Asuncion. Louise Trotter grew up in a musical family. Her father was a high school band director and he built her first harp by hand. She had musical training in piano and harp since early childhood, with more advanced studies at Texas Women's University and with Mildred Dilling in New York City. She was harpist with Beaumont Symphony, and Baytown Symphony for a number of years. Her interest in modern harmony led to studies with the leading pop and jazz artists in the country. Barbra Bailey Bradley, originally from Canada, holds degrees from the University of Western Ontario, the Western Ontario Conservatory of Music, and Indiana University, where she studied both piano and harp. Returning to the harp has redefined her musical career. She has recorded two CDs of her harp compositions and arrangements – Straight from the Harp and Harp-Felt. The printed music from these CDs is also available in three self-published books. The Fantasy for Harp and Chamber Orchestra, arranged for harp and piano, and two books of trios, Harpists Three, and Vignettes, are also available in self-published format. In addition to solo work, she performs with and directs the Heatherwood Harp Ensemble, and has created compositions and arrangements for their concerts, as well as other ensembles. Ms. Bradley performs as harpist and pianist in Washington, DC, Maryland, and Virginia, and teaches both instruments at the National Cathedral School in Washington, DC. Ms. Bradley is Treasurer of the International Society of Folk Harpers & Craftsmen, as well as Treasurer and Annual Concert Coordinator for the Washington Area Folk Harp Society. You can find more information about Barbra at http://www.beeharp.com/. You can contact her at barbrabaileybradley@gmail.com. Sadie Turner, 1st prize winner of the American Harp Society’s National Competition, made her solo debut at age 18 with the Houston Symphony Orchestra as winner of their High School Concerto Competition. As a recitalist, she has performed throughout the United States. In the orchestral arena she has performed with the Houston Symphony, New World Symphony, Shreveport Symphony, Arkansas Symphony and the Rice University Symphony and Chamber Orchestras. During the summers, she has also participated in several acclaimed festivals such as the Tanglewood Music Center for two summers, the International Festival Institute at Round Top, Texas Music Festival and the Salzedo School for Harp. Christa fell under the spell of the harp during her first lesson at 16. Two years earlier, she was transfixed by live jazz during a performance at her high school. The two influences have shaped, but not limited her explorations and accomplishments on the instrument. Equally adept as both a classical and jazz harpist, she is one of those rare individuals who can make the transition from the jazz rhythm section to the symphonic string section sound effortless. The appeal and respect her music generates has taken her throughout the U.S., Canada and Europe as an invited soloist and clinician at all the major harp festivals and conferences. Christa released her first jazz harp recording, freefall, in 1996, on the Freefall Music label. Her second recording, Cheek to Chic was released in 2002. She is the President and CEO of Freefall Music, and founder of ArtnHarp, a division of Freefall Music. She currently sits on the board of the Detroit Musicians Fund, and is a past board member and executive committee member of the American Harp Society. Upcoming national and international appearances include performances at the 2010 Conference of the American Harp Society in Tacoma, Washington, and the 2011 meeting of the World Harp Congress in Vancouver, British Columbia. In 2007, Dr. Alfredo Rolando Ortiz was invited to compose a piece to be premiered on July 22, 2008, during the Tenth World Harp Congress in Amsterdam, The Netherlands. Originally composed for four harps or harp ensemble, the piece was performed by 232 harpists, breaking the Guinness World Record of the largest harp ensemble to date. In April, 2009, performing his own compositions, he was one of the winners of the Beverly Hills Chamber Music Auditions of the Southern California Chamber Music Presenters Consortium. On July 19, 2009, twelve 5th grade harp students of Lou Anne Neill (harpist of the Los Angeles Phlharmonic), from Moffett Elementary School, performed Alfredo’s composition PAISAJE, during the Opening Night Gala of the Hollywood Bowl, accompanied by the Hollywood Bowl Symphony, for an audience of over seventeen thousand. Internationally acclaimed by the critics, soloist of the "arpa paraguaya" (Paraguayan harp), a composer, author, educator and recording artist, Alfredo Rolando Ortiz considers his "most important concert" playing the harp in the delivery room during the birth of his second daughter. Alfredo was born in Cuba. When he was eleven years old he immigrated with his family to Venezuela. Four years later he began studying the Venezuelan folk harp with his school friend Fernando Guerrero. A year later he became a pupil of Alberto Romero on the Paraguayan harp. Just two years after his first harp lesson, he began medical studies in Medellín, Colombia, began performing professionally and recorded his first album. Music supported his medical studies until graduation. Five years later he moved to the United States to continue studies of Music Therapy. Two years later he married Luz Marina Otero. For eight years from the time of his graduation from medical school, he worked in the medical field as well as a harpist and recording artist, until his wife became pregnant. In order to have time for his growing family, he then decided to dedicate his life only to them and to his first love: the harp. A veteran member of McNeese’s music faculty, Miss Belew is a graduate of Hardin- Simmons University (Abilene, Texas) and Indiana University, who has taught piano and harp, as well as courses in pedagogy and literature of the two instruments. She has coached both MSU’s harp ensemble and that of the Louisiana Chapter of the American Harp Society. 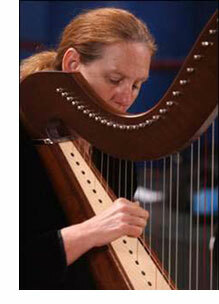 Barbara founded the first American Harp Society chapter in Louisiana in 1972. She was the Southern Regional Director of the AHS from 1973 to 1979. She has played harp in the Lake Charles Symphony and several other area performing organizations, including Baton Rouge Symphony, Rapides Symphony and the opera in Beaumont, Texas. Miss Belew maintains active membership in the AHS chapter, the Lake Charles Piano Teachers Association, Louisiana Music Teachers Association, and Delta Kappa Gamma Society International, honorary/professional organization for women educators. She recently was named to the 2010 edition of Who’s Who in America. Barbara was the founder of the McNeese Summer Harp Camp in 2000. You can contact Barbara Belew at bbelew@mcneese.edu. Mary Radspinner began harp studies with Jeanne Henderson in the Milwaukee Public School System. Jeanne provided many kids with the opportunity to learn the harp who may have never had the luck otherwise. Mary credits her love of music and the harp to Jeanne, a wise teacher who imparted many different styles of playing to her students, preparing them for all kinds of work in the music world. She also studied string bass and voice. In 1977 she earned degrees in applied harp and music education from Alverno College in Milwaukee, WI. During the next 10 years she taught elementary general music, elementary band, high school orchestra, choir and music theory. Mary free-lanced in Houston for 11 years, playing an average of 4 events per week, and during that time she served as substitute harpist with the Houston Symphony and second harpist with the Houston Ballet Orchestra. She has served as president of the San Jacinto Chapter of the American Harp Society, SW Regional director of the American Harp Society, and president of the International Society of Folk Harpers and Craftsmen. She chaired the International Folk Harp Conference held in Galveston in 1998. Mary is the immediate past president of the Scottish Harp Society of America. She served as editor-in-chief of the Folk Harp Journal for a six-issue interim. In 1993 Mary and her husband John Gill opened Melody's Traditional Music & Harp Shoppe, a harp specialty store in Houston, TX. In 1999 Mary and husband John established Afghan Press, specializing in harp music publications. Afghan Press is named after John and Mary's beloved Afghan Hound, Melody. (1987 - 1998). Mary instituted the harp events at the TX Scottish Festival in Arlington, and has chaired the harp competition events for the Houston Highland Games. She was a winner in the Florida Summer Harp Seminar pop harp competition in 1994, and is the 1995 Texas champion Scottish harper. She performs and gives workshops throughout the country on harp techniques for relaxation, ensemble ideas and improvisation. You can find out more about Mary Radspinner at www.maryradspinner.com and contact her at mary@folkharp.com. Known for her bold interpretations and diverse repertoire, Dr. Ann Yeung has performed in festivals throughout Europe, Asia, and the Americas. She has won top prizes at the Nippon International Harp Competition, Lily Laskine International Harp Competition, American String Teachers Association National Solo Competition, Anne Adams Awards, and Ruth Lorraine Close Awards. To her credit, Dr. Yeung is the only person to simultaneously receive first prizes in the two highest divisions of the American Harp Society National Competition and Prix Renié. As a winner of Artists International, Dr. Yeung premiered her transcription of the Goldberg Variations at Carnegie Hall in 1999. She has premiered numerous compositions, including multi-media works at World Harp Congresses in Dublin and Amsterdam, and the National Flute Convention in New York City. She has made recordings for the Innova, Fons, Albany and Cadenza Labels. Singer and Harpist Cecile Corbel was born in Brittany, in the Finistère, at the very west of Europe. In her teens, after learning the guitar, she discovered the Celtic harp. The young Breton composer and singer now shares her “pop folk Celtic” music with her musicians in France and abroad. The New Orleans Chapter of the American Harp Society recently received a grant from the American Harp Society to produce a series of radio interviews with harpists. The finished interviews, with related music clips, will be broadcast on the Harpestry radio program of KRVS in Lafayette, LA and other National Public Radio stations. The series will also be available on the internet at www.krvs.org. 3. A Latin harpist-Edmar Casteneda. 12. Ann Yeung and contemporary.compositions for the harp. Latin jazz harpist & composer, Patrice Fisher, has been performing and recording her own compositions since 1980. She has recorded 13 albums of original music, including her latest CD, "Music of the Three Americas." She has performed at such international festivals as the Cancun Jazz Festival, the Jambalaya Jazz Festival in Ilhabela, Brazil, the Trova Jazz Festival in Guatemala and the Festi Jazz in La Paz, Bolivia. Patrice also performs Celtic music and is director of the New Orleans Celtic Harp Ensemble. “An unexpected delight!” raves David Fricke of Rolling Stone Magazine. Gene Scaramuzzo of Gambit newspaper says of Arpa "There are many sides to this local composer/harpist. It's not unusual to see her play a staid classical gig in the morning and a smoky music club at night. Strong rhythms form the undercurrent of her instrumental music with Arpa." You can see videos of Patrice Fisher’s original compositions at http://www.youtube.com/watch?v=jMxQ4RHlUbs. You can hear music clips of patrice’s music at www.myspace.com/patricefisher. And read more about her at www.patricefisher.com.